The final day of racing at the 2018 420/470 Junior European Championships in Sesimbra, Portugal dawned with light fog, that was replaced early on by an unsettled breeze of around 8-9 knots. Another light breeze day favoured the lighter teams and light wind specialists, which balances the stronger wind during the first half of the Championship. In the 470 Men the gold medal was decided yesterday to Maor Abu/Yoav Rooz (ISR) with the battle for silver and bronze in a head to head between just two teams. In the 470 Women, Theres Dahnke/Birte Winkel (GER) had wrapped up gold or silver, with any of those placed 2 through 6 capable of claiming the silver or bronze, so all to play for. In the 420 fleets, two races meant that everything was all open, but with leaders looking well entrenched at the top of the leaderboard, it would need a disaster for them to be overthrown. Spain’s Martín Wizner/Pedro Ameneiro went into the final two races, 11 and 12, with a 12 point lead and a worst discard score of 6th. All they needed was a top result in race 11 to have the Championship title in their hands, and their 3rd place finish was more than enough to earn the pair the gold with a race to spare. Their cruise through the Championship with a string of top six results has not been easy, but with gold in the bag they eased off for the final race to finish 39th. An impressive outcome for the Spanish team who wrap up the 420 Junior European Championship gold and 420 World U17 gold within just over 6 months, off the back of winning the 420 U17 Junior Europeans last year. “We just concentrated on each start and getting to the top mark in the top 10,” continued Wizner, “and were boat by boat until the end of the race. We didn’t take any big risks. “Next we have the 420 Worlds in the USA, which will be another level of regatta with more countries and more boats, and maybe top10 or 5 would be amazing. But for now we are here in Portugal and want to celebrate this moment." Silver to Enzo Balanger/Gaultier Tallieu Gueydan (FRA) and bronze, a best ever result, to Pablo Ruiz/Miguel Martínez-Fortún (ESP). “We are very happy and our hard work has paid off in a very difficult week with lots of ups and downs, and we finally managed to claim bronze,” exclaimed Ruiz. Clara Olive/Solenza Mariani (FRA) secure the 420 Women Junior European title, with silver to Ariadni-Paraskevi Spanaki/Myrto Papadopoulou (GRE), and bronze to Carlotta Scodnik/Camilla Scodnik (ITA). Turkey’s Begum Boke/Zeynep Kocyigit win the silver fleet and rank as top placed women’s team. Like many of the teams competing at the Junior Europeans, their next stop is the World Sailing Youth Worlds in Texas, so they head to the USA with fresh race track experience. The U17 overall leaderboard went to a final race decider. Australia’s Cole Tapper/Tyler Creevy scored their worst result of the series, a 35th but with their closest rivals Jakub Gołębiowski/Filip Szmit (POL) also back in the pack, they were safe for the overall victory in the Open European fleet. Whilst the Aussies and Polish battled it out, Spain’s Jacobo García /Antoni Ripoll finished race 12 in third, and leapfrogged over the Polish to take second overall, and the European Championship gold medal, which is awarded to European teams only. “This is pretty massive for us as it is our first international regatta win so we are really happy with that,” said Tapper. “There was lots of pressure on today on the water and we are really happy to have got the job done." Next up for the Aussies is the 420 Worlds in Newport, USA, 7-15 August, where the pair hope to repeat their form, but know the challenge will be very different. In 9th overall and claiming the U17 Women’s Junior European title and gold medal are Melina Pappa/Maria Tsamopoulou (GRE). Zofia Korsak/Karolina Cendrowska (POL) finished 16th overall and end their Championship with the women’s silver medals. 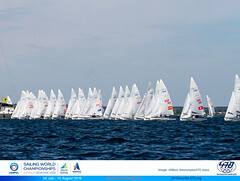 Marina Garau Bosch/Blanca Cabot Sancho (ESP) won race 12 and with it moved up to 26th overall and the bronze medal. Israel’s Maor Abu/Yoav Rooz wrapped up the gold medal yesterday and just need to start and finish the medal race. The pair has taken every opportunity to dominate the race track, winning over 50% of the 11 races before the medal race. They kept clear in the medal race, finishing 10th and letting the battled for silver and bronze unfold ahead of them. The pair has finished secondary schooling and both are in a sports athlete programme in the army, so can now dedicate plenty of time to training. “I think in our country that the attitude for sailing and windsurfing is very good, and also even if all the money goes to football and basketball, I still believe sailing is the best sport in the country,” concluded Abu. Hungary’s Balázs Gyapjas/Zsombor Gyapjas managed to outpace Nitai Hasson/Tal Harari (ISR) in the medal race, finishing 3rd compared to the Israelis 9th place and secure the silver. Bronze to Hasson/Harari. “Ah, we are really, really happy of course. We are satisfied with our performance and we improved I guess during the week, so that was key,” smiled Balázs. Along with their silver medal, the brothers also secure a milestone performance. Up next is 8 days rest back in Hungary, and then onto Denmark for the Sailing Worlds and the first shot at qualification for the 2020 Olympic Games. 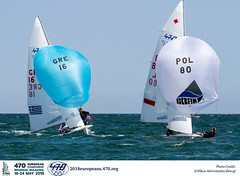 Theres Dahnke/Birte Winkel (GER) were in the running for a guaranteed gold or silver and holding a 16 point advantage over the next boat, with numerous chasing teams in contention for silver and bronze behind. When Italy’s Maria Vittoria Marchesini/Cecilia Fedel were over the line, the Germans knew gold was assured, and sailed safe to a 6th place, finish more than enough to give Dahnke/Winkel the gold medal. “It is amazing to have the gold medal now, really awesome,” said Winkel. 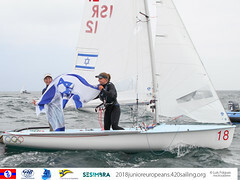 Winning the medal race and claiming the silver medal were Yahel Wallach/Omer Bilia (ISR), with bronze to Paola Amar/Marine Riou (FRA). The Israel pair were amongst the underdogs for a podium spot, so were delighted at their gain. Wallach finished 2nd at the 420 Worlds several years back, and their medal marks a career best in the 470. Up next is the 470 Junior Worlds in Italy, 19-26 August, where they plan to take out another podium finish, but will have the Germans to overcome. Nations competing: Australia, Austria, Croatia, France, Great Britain, Germany, Greece, Hungary, Ireland, Israel, Italy, Japan, Poland, Portugal, Singapore, Slovenia, Spain, Switzerland, Turkey, and USA. Video and Photos – daily videos and photos will be produced for social media and websites, which will be available on the Championship website and 420 and 470 Class social media.